A few weeks back I received a call from an advocate’s office asking me to visit the court with regards to a civil case filed against me. This took me by surprise and when asked for more details, the caller did not provide any or did not have any. On further investigation, I found that the dispute was regarding a bill settlement (of a leading internet service provider), which I had cleared six months ago and asked for discontinuation of services. Despite a busy day at work and because this call was quite unsettling to me, I called the customer center, visited one of the walk-in stores and tried to explain myself. To my surprise, even after understanding my entire case, none of the agents were willing to help! All I got was another number of some customer advocate team to reach out to. Why should I be calling when I have settled what was asked??? Nevertheless, I went ahead and dialed the so-called ‘Customer advocate team’ only to explain myself all over again and to receive a list of action items from them. This did not go down too well with me and I called up a friend, who also happens to be a corporate lawyer, for consultation. He asked me if I would like to file a defamation or harassment case against the company. While I did not go that way, I ensured I write aggressively about this on my blog and other social platforms. Is this how you are handling today’s customer? We are deep in the age of the Customer where the speed at which people decide or react or engage has increased manifolds, and if you are not willing to acknowledge this fact you are choosing to be oblivion. Let’s see some ‘qualities’ (that you may not like) you could attribute to today’s modern customer, some stats around it and the cause and effect. I was going through an annual internet trends report collated and presented by KPCB (Kleiner Perkins Caufield Byers) and some stats given below are worth noticing. 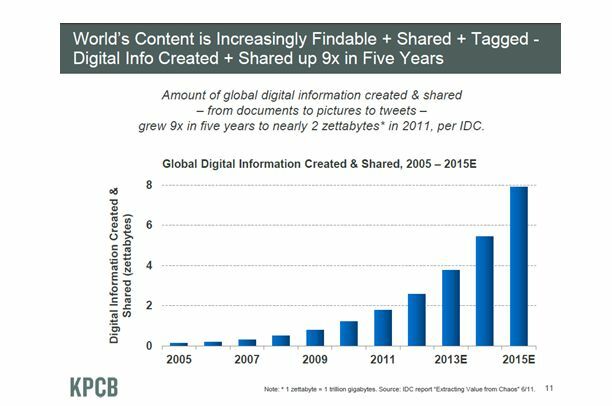 Below slide gives a projection of the data that would be shared socially worldwide. Earlier interactions used to be between individuals, if a consumer had a concern, they would have shared with the supplier or service provider but imagine a bad feedback with mentions of your organization being posted by one individual but read and shared by others exponentially. Is your Service Organisation Modern enough? Are you available for your customer wherever and whenever your customer wants you to be? Are you putting your money at the right place? Training the right people? Using the right applications? Are you operating a cost center or a profit center? Are you providing a multichannel experience? For example, let’s see the progress of a service organization or contact center. I will also try to relate to what my service provider did not do or could have done. 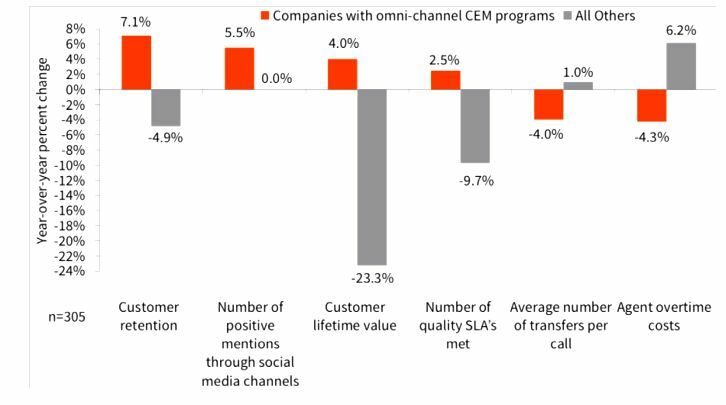 A study conducted by Aberdeen Group in March 2014 highlights the business value addition with the implementation of an Omnichannel experience. The numbers below from this report should be incentive enough in adopting this change. AT CRMIT Solutions, the consultant’s team agrees with this business benefit of Customer Experience Management and is equipped to deliver it. Oracle Service Cloud applications provide best in class unified Omnichannel experience and our CRM++ products seamlessly integrate to enhance the utility even further. As for my Internet service provider, I tried sending my business card to, I am hoping they think about getting to this level pretty soon or they would be left pretty far behind. This entry was posted in CRM, Customer Service, CX, CXM, New Customer, Oracle, oracle cloud, SaaS, Uncategorized and tagged cloud, content marketing, CRM, Customer, Customer Experience, CX, Modern customer Experience, Omnichannel experience, Oracle Service Cloud applications. Bookmark the permalink.